When the Cellynne Paper Corp. in Haines City, Fla., needed to upgrade its existing facilities to meet current FM Global insurance requirements, it turned to general contractor Alan Ulch Inc. in Winter Haven, Fla. As a Columbus, Miss.-based Ceco Building Systems builder, Alan Ulch Inc. had years of experience with metal building construction and had worked on the nearly 300,000 square feet (27,870 m2) of Ceco buildings at the Cellynne facility alone. Generally, these Ceco buildings were acceptable to FM with some minor alterations required for fire safety. 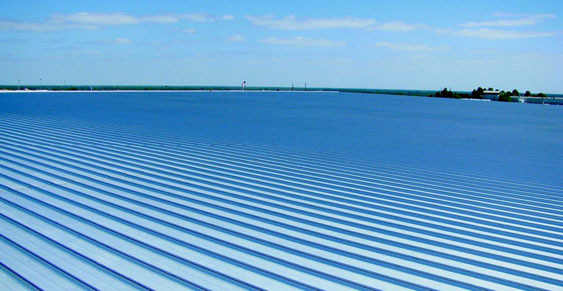 However, a 410-foot- (125- m-) wide by 260-foot- (79-m-) long metal building constructed in 1983 needed a new roof system. Originally designed for 100-mph wind speed, FM was now requiring Cellynne to upgrade the existing roof to meet FM Global I-120 requirements. 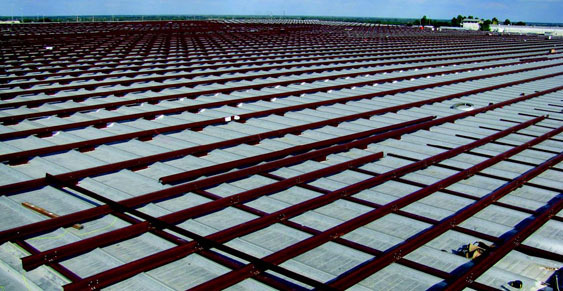 MBCI, Houston, was contacted for its expertise in retrofitting existing building roofs. The project had all the usual issues and existing structural components that would have to be addressed for the new roof to become FM certified. The existing structural system had purlins spaced every 5 feet (1.5 m); the roof system was a trapezoidal standing seam with a floating stand-off clip; and the buildingâ€™s width caused excessive thermal expansion. With these conditions, MBCI realized a new subpurlin framing system would have to be engineered. The new system needed to satisfy the new roofâ€™s field, edge and corner zone panel clip attachment due to the increased wind uplift requirements of FM Global I-120 mph. It also had to accommodate more than normal expansion and contraction because of the buildingâ€™s 410-foot width. Therefore, MBCIâ€™s 18-inch- (457-mm-) wide, 22-gauge Double-Lok roof systemâ€™s clip attachment required a new subpurlin spacing of 5 feet in the field of the roof and edge zones and 2 1/2 feet (0.8 m) in the corner zones. 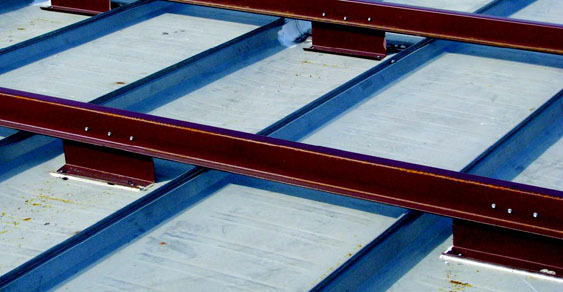 MBCI designed a new zee purlin system to anchor to the existing purlins, leaving the existing roof in place. With the old roof having a major rib height of 3 inches (76 mm) plus, intermittent 6- by 12-inch- (152- by 305-mm-) long zee spacers were installed in the field of the roof at 4 feet (1.2 m) on-center directly to the existing purlins in the pan of the panel. These spacers also accommodated the panel to be drawn down to a tight connection and allowed new roof plane alignment of the new purlins. At the edge zones, new 4-inch (102-mm) base zees were installed across the existing purlins spaced at 4 feet on center along each eave and up 25 feet (8 m) from the existing eaves. These base zees then received new 3 1/2-inch (89-mm) zee purlins attaching with a light-gauge flange-to-web clip. 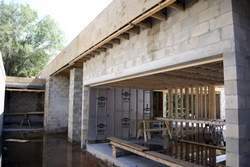 Typically, the edge zones would have required less than 5-foot purlin spacing, but because MBCI incorporated its Double-Lok wind reinforcement clamps, a 5-foot purlin spacing was sufficient. The thermal expansion and contraction was satisfied by using MBCIâ€™s 4-inch Double-Lok sliding clip. Instead of insulating between the old and new roofs, Alan Ulch Inc. elected to employ eave and ridge ventilation components to promote reduction in heat flow for above sheathing ventilation. Published: Monday, August 17, 2009 at 6:12 a.m.
Last Modified: Monday, August 17, 2009 at 6:12 a.m.
WINTER HAVEN | Winter Haven's first LEED-registered home is well underway on the shores of Little Lake Otis and both the contractor and architect say the job represents a culmination of their prior experiences - and a glimpse of what their work is quickly becoming. When finished, the Strang home will include a courtyard, as well as a number of energy-efficient features, such as multiple types of insulation and geothermal air- conditioning. 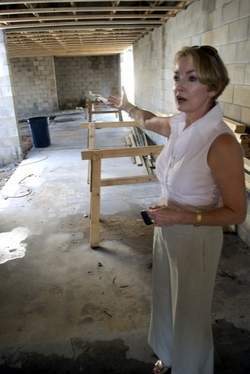 Sheryll Strang gives a tour of the site. Carl Strang are having the first LEED certified home in Winter Haven built. MAX STRANG, a Miami-based architect, is designing his parents' home, which will be environmentally efficient. Earning LEED certification, which stands for Leadership in Energy and Environmental Design and is granted by the U.S. Green Building Council, means adhering to strict standards for everything from energy savings to water efficiency to reduced emissions. Registering a project with the U.S. Green Building is the first step in earning the certification. 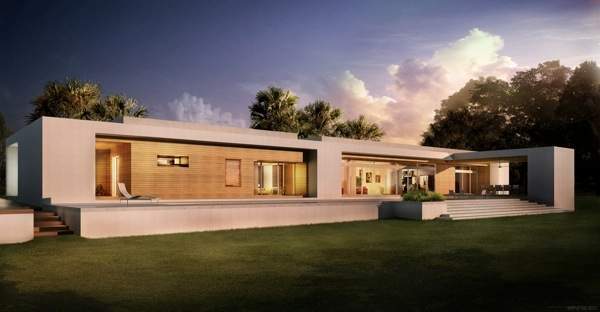 The home belongs to Sheryll and Carl Strang Jr. and is being designed by their son, Miami-based architect Max Strang, of Max Strang Architecture, and built by Alan L. Ulch Inc. Situated at 1190 W. Lake Otis Drive, the house measures about 4,200 square feet, will have four bedrooms and 4 1/2 baths, a lap pool, courtyard, and all kinds of audiovisual gadgets. It is also, as you might expect, planned to be chock full of environmentally friendly products and features. The roof will be covered with a white membrane to keep it cooler than your standard asphalt-shingle roof. 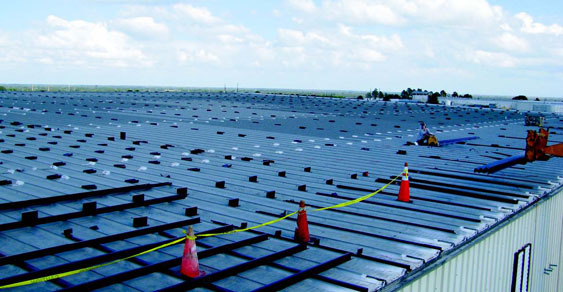 Applied on top of the membrane will be peel-and-stick solar panels installed by Quickbeam Energy of Winter Haven. Carl Strang Jr., a self-described "capitalist," is chairman of the company, which designs and installs solar power systems; it is one of many businesses Strang has ties to. The membrane will help reduce energy use while the solar panels will generate much of the energy the house requires. The house will literally be like a large, live-in cooler thanks to multiple types of insulation, including a foam spray that will ensure there are no gaps for air to enter or exit. The south and southwest sides of the home were designed with a minimal number of windows to eliminate as much heat as possible. Sliding glass doors at both the rear and front of the home that when open will create cross-ventilation. Geothermal air-conditioning that will use the ground and water from nearby Little Lake Otis to cool air for the home. Concrete flooring made using fly ash, a powder created when electric power is generated, thus putting to use what would otherwise merely be a pollutant. Equipment to capture rainwater to use it for landscaping and filling the pool. Lumber that meets Forest Stewardship Council standards. 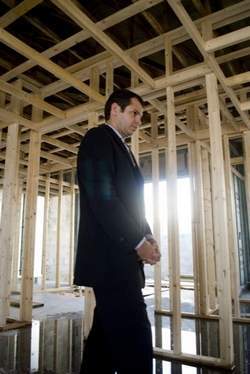 Using such materials as the lumber has been one of the greatest differences in this project from others he's been involved in, said Curt Ulch, vice president of Alan L. Ulch. 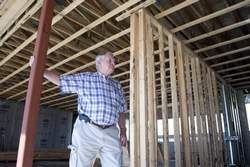 "You don't just go out and buy FSC wood," he said, adding that many of the details that will qualify the home for LEED certification require extra time. But time consumption aside, Ulch said it is fulfilling to build one project that incorporates many years of environmentally friendly efforts. He recalled that his company first started using Dow Corning Tuff-R insulation, which helps reduce air infiltration, 20 years ago. The same insulation is being used on the Strang project. For Max Strang, who graduated from Winter Haven High before going on to the University of Florida and Columbia University, designing his parents' future home has been a chance to focus on his true passion of residential design; his firm also does commercial work. Also, the project is a chance to implement what he knows about green design - and do some learning, too. "I'm still learning. Green technology keeps changing," he said. "I take a lot of pride in advancing the sustainable concepts." The more than $1 million house - or "until I'm broke," said Carl Strang - will be ready for occupancy later this year and the couple can't wait to call it home. "I was an environmentalist before it was cool. I'm also cheap and don't like big light bills," Carl Strang said jokingly. But in all seriousness, he added, "We need to take care of God's creations." Copyright © 2009 TheLedger.com — All rights reserved. Restricted use only. Copyright © 2014. Jeff Thompson - Jeff 3D Web Design | Motion Graphics All Rights Reserved.